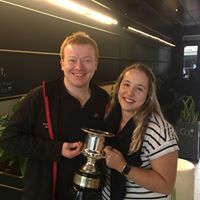 At the New Zealand National Brass Band Championships this weekend, Iain led Brisbane Excelsior Band to take first place in the contest. Although he originally received the best soloist in the set work award, this was apparently a mistake and the prize ended up going to the band’s flugelhorn player Tamaryn Heck instead. Here’s Iain handing over the trophy to Tamaryn once the mix up had been resolved.